Today I walking towards Piazza del Duomo along the only street something caught my eye – Il Grand Sasso was open again. Gran Sasso’s opened in 1969 and has been run by the Sferrella family since 1974. 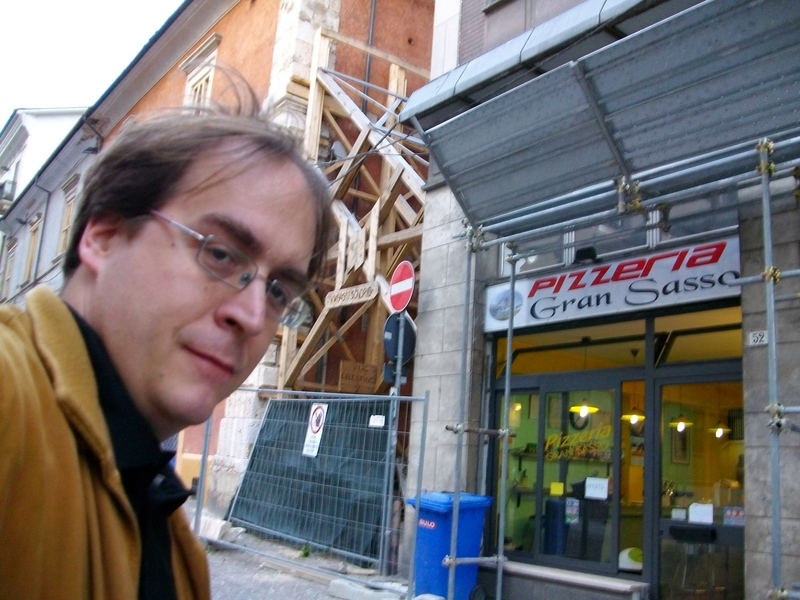 The place is simple, they only make good pizza and baked single-portion calzoni. Nothing more but more then enough. Their pizza is a bit oilier than the others, and the crust is fluffier. 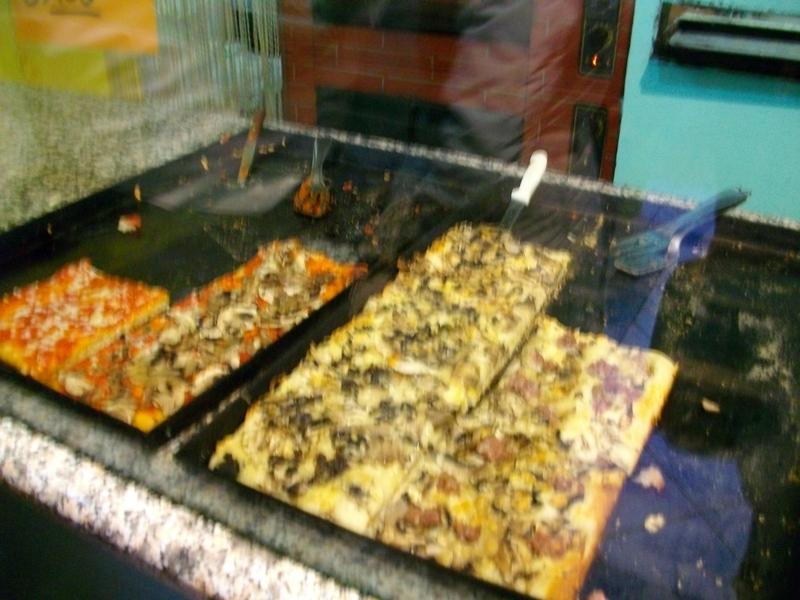 I had my favorite of theirs: a square of white pizza with mozzarella, mushrooms and sausage. A great way to celebrate Spring. Now between Corso Federico II and the upper half of Piazza del Duomo four shops are open: Bar Frattelli Nurzia (coffee and homemade candy), Ottica Centrale (eyewear), Giolleria Armenia (jewelry) and the Pizzeria Gran Sasso (pizza by the slice!). PS: I’m writing this from Piazza del Duomo. The sun has come down so my fingers are freezing. More photos to come. 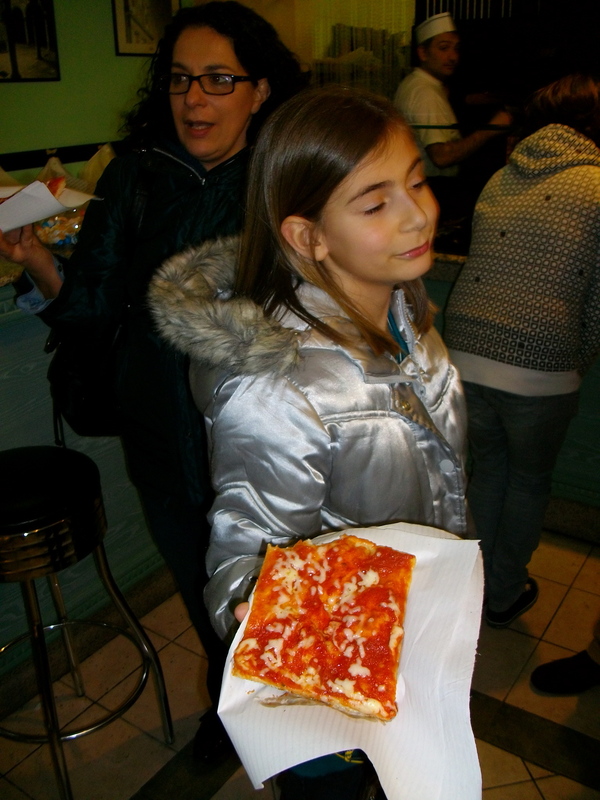 Emily and her slice of margherita, Gran Sasso reopens April 1st! 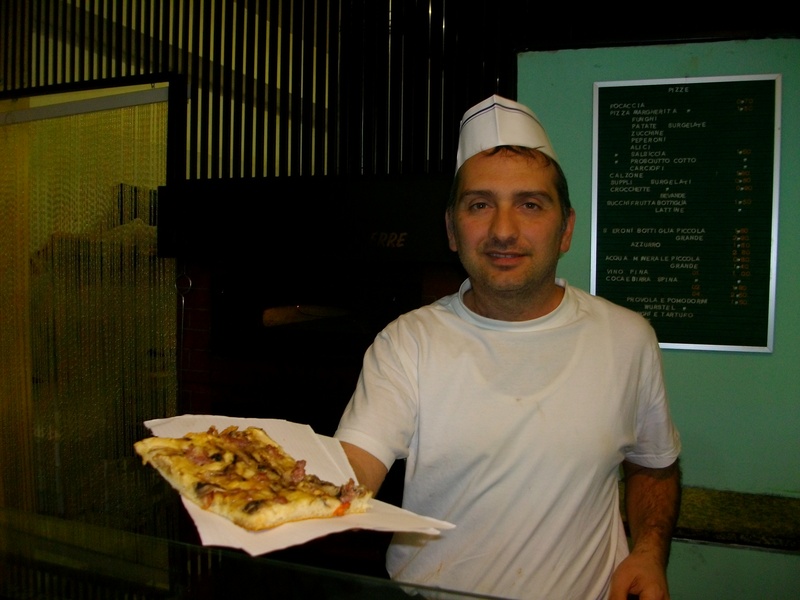 This entry was posted in Uncategorized and tagged abruzzo earthquake, abruzzo pizza, bar nurzia, carbonara, corso federico II, corso federico II l'aquila, frattelli nurzia, good pizza, gran sasso, italian pizza, joshua john lawrence, joshua lawrence, l’aquila, l’aquila earthquake, nurzia, nurzia l'aquila, pizza, pizza gran sasso, pizza in l’aquila, pizza rustico, pizzeria gran sasso, pizzerie in l’aquila, post-earthquake l'aquila, post-quake, sferrella. Bookmark the permalink.